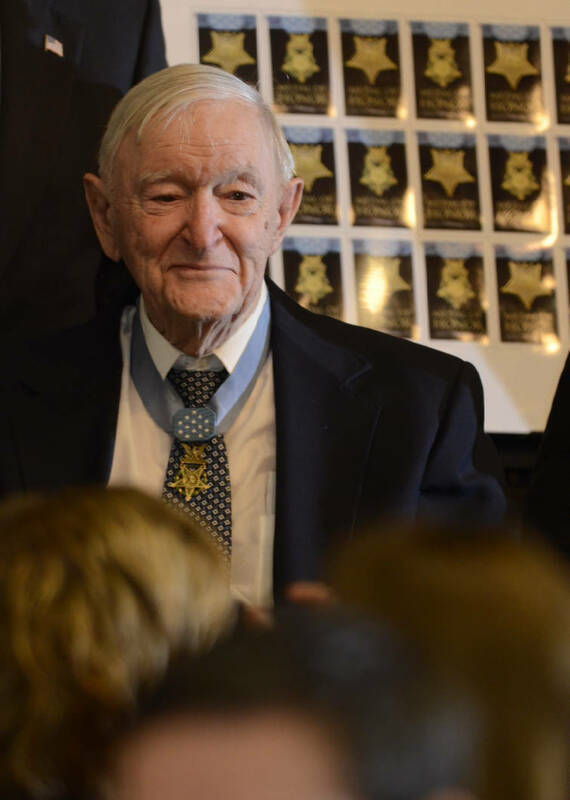 Medal of Honor recipient Charles Coolidge attends a ceremony and reception Wednesday at the Signal Crest United Methodist Church. The event marked the first day of issue of a commemorative stamp honoring Medal of Honor recipients. It's a sure bet that when editors in the newsrooms of the Chattanooga Daily Times and Chattanooga News-Free Press were planning coverage of "Coolidge Day" on Aug. 8, 1945, they never considered that the atomic bomb would be dropped on Hiroshima two days before. Chattanooga had a daylong event honoring Technical Sgt. Charles H. Coolidge set for Aug. 8, 1945. Coolidge, a 24-year-old resident of Signal Mountain, had been awarded the Medal of Honor seven weeks earlier in Germany for his heroism in World War II. There would be a luncheon at Hotel Patten (now the deteriorated Patten Towers) for Coolidge featuring Sen. Kenneth D. McKellar, who the News-Free Press described as the "president of the United States Senate and one of the leading men in the national government." A "procession of cars" would travel through the "flag-draped city" to Memorial Auditorium where Chattanooga Mayor E.D. Bass announced a new park named "Coolidge Riverside Park" to be located between the Walnut and Market street bridges. But President Truman dropped the atomic bomb and Coolidge became a secondary event. "The atomic bomb, can you believe that?" said retired Lt. Gen. Charles Coolidge Jr., who would be born a year later. "My dad was overwhelmed by the response." The morning Times carried the first-day news about the war, announcing, "Hiroshima 60 Per Cent Destroyed by Blast of One Atomic Bomb." Four stories on the war occupied seven of the eight columns on the front page; a preview of the day's Coolidge event was in the eighth column. The lead news story talked about the end of the war less than 48 hours after the bombing, saying, "a Japanese city the size of Memphis" was in ruins and that the "devastating atomic bomb underscored tonight the predictions of a new surrender-or-die ultimatum to Japan." No stories reported potential casualties. The afternoon News-Free Press, with the advantage of the passage of more than 12 hours of time since the Times was printed, advanced the news for Chattanooga residents. Its double-deck, eight-column, all capital letter headline screamed, "Russia Declares War on Japan; Atomic Bomb Killed 150,000 Japs" and was accompanied by four additional war-related stories. With "Coolidge Day" unfolding its news cycle, the News-Free Press used three columns under its war banner headline for a photograph and a three-column headline proclaiming, "City Honors Sgt. Coolidge; Other Service Personnel" followed by reporting on the day's events. The story reported on Coolidge being joined by Medal of Honor winners Sgt. Paul Huff of Cleveland and Sgt. Raymond Cooley of South Pittsburg and Sgt. Alvin York of Pall Mall, Tennessee, who the newspaper called "the nation's No. 1 hero of World War I." The News-Free Press carried a full page of coverage of Coolidge inside the front section. There were four photographs, a story on the naming of the park and a report on Coolidge's parents' reaction to the Kiwanis luncheon honoring their son. In addition, there was a report headlined, "25,000 May See War Shows at 2 Theaters." With the war in Europe won, the war in the Pacific decided and the newspapers full of military coverage, Chattanooga residents were fully engaged, as the News-Free Press reported, "So whole-hearted has been Chattanooga's response to the showing of war films at the State and Grand theaters that between 20,000 and 25,000 war workers will have witnessed these actual combat pictures when the special two-day program is completed here tonight." But the news of the day in Chattanooga on Aug. 8, 1945, was not solely about Hiroshima or Coolidge. Both newspapers reported on Georgia voters approving a new state constitution and trial dates being set for Nazi war criminals. The News-Free Press had breaking news on two Dayton, Tennessee, teenagers arrested for kidnapping, beating and robbing a prominent physician. Then there were two paragraphs in the lower, right corner of the News-Free Press about William B. Stout. Only days after the world was introduced to atomic power, the Ohio engineer announced that the "harnessing of the atom will eventually reduce automobile motors to the size of a man's fist." Stout said the evolution would take "many years," adding, "I expect to see gasoline used as long as I live." Conact Davis Lundy at davislundy@aol.com.